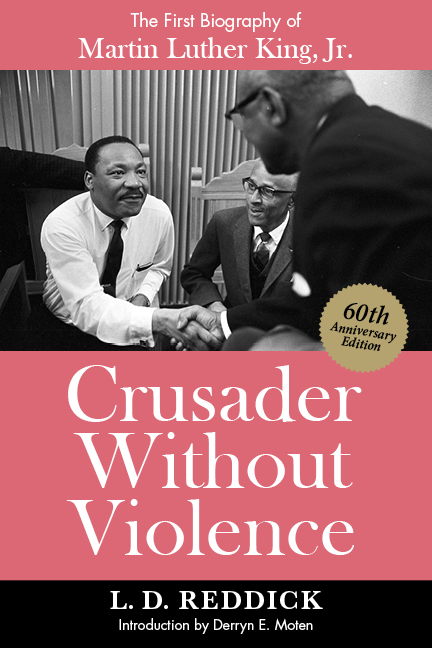 Crusader Without Violence: A Biography of Martin Luther King, Jr. Published to critical acclaim in 1959 and long out of print, Crusader Without Violence was the first biography of the dynamic leader who emerged from the 1955–56 Montgomery Bus Boycott as the spokesman of the twentieth century American civil rights movement. NewSouth's 60th Anniversary Edition, with a new introduction containing new biographical details about its author, returns to general circulation a valuable, rare, and engaging account of Martin Luther King Jr. before he became an American phenomenon. The author, L. D. Reddick, had known the young King in Atlanta. They became reacquainted when Reddick moved to Montgomery in 1956, where King pastored the Dexter Avenue Baptist Church. Reddick became a congregant and King's friend and was active with him during the bus protest. He was thus able to report firsthand and at length on King within the setting of the young minister's early career and family life. Paradox and contrast marked King from the first. Born and schooled in a relatively comfortable segment of Atlanta's black community, he decided to take the part of the underdog. With a PhD from Boston University and a likely career in teaching or a Northern ministry, he chose instead to return to a Southern community. Short, soft-spoken and scholarly, he was thrown into a situation that required stature, tough-mindedness, and ability to move the masses. How he emerged into an unsought role of mentor, strategist, spokesman and leader of a movement that took a major stride toward freedom is the story Reddick tells in Crusader Without Violence. The book peers intimately into the lives of African Americans in the South at that critical juncture — a few years after the Brown decision but before the sit-ins, freedom rides, and voting rights demonstrations resulted in sweeping change in the 1960s. Reddick himself was noteworthy, a distinguished historian who would soon fall victim to Alabama's rigidly segregationist state government. Derryn Moten, the champion of this new edition, provides an introduction that puts Reddick's biography of King into context, updates Reddick's life after he was forced to leave his teaching position in Montgomery, and explains why Crusader Without Violence — notwithstanding the hundreds of books published on King's life since this one — remains a significant historical document.